Belmont has trailed by as many as 14 today. Take away Thursday and 2 games against Lipscomb, and, their season doesn’t look that impressive to me. UCLA was playing like a D2 school when Belmont beat them. They are not that talented, but they are disciplined and play very smart ball. When they get rattled though it falls apart like against JSU and today when they got down by 16. Unfortunately we did nothing to get them rattled and they controlled the play after the 1st minute of the game on. I still think if Ja did not go down and we had dictated the pace we would have won going away. I'm going to say this again. Belmont=Samford. Neither have the best athletes and run niche garbage. Like Princeton used to do. I haven't been impressed with Belmont at all this year. Even after our loss to them Saturday and now seen them in person twice now. We had a 14 point lead in the second half and they lived on back door cuts. Probably scored at least 30-40 points on back door cuts alone. Say what you want about us giving the lead up, but I'm not impressed with them as much as I usually am. We led a majority of the game without Dayton who could probably be a starter for any other team in the league. This is NOT a knock on Dayton but he wouldn’t start for us. Yep Chris we know all about those back doors cuts lol ate us alive too. Also tip of the cap for agreeing on Twitter over the so called morant charge. That's how you know officiating is terrible when Peay fan agrees with a Murray fan haha. Hate that we play their on early Thursday this year not going to be able to make the trip. Those 2 rivalry games are going to be good! Belmont plays physical down low and are so well coached that are always a step ahead and shakes teams every year. They play a little dirty too and again throw post players out of rythem. JSU figured it out and got physical back. Hopefully coach has our boys ready to bang Thursday or it will happen again. Going to be a wild tournament in Evansville. I mean, I try to be a realist. Dude from Belmont never stood his ground. At all. I haven't watched it since the first time I saw it, but even if Ja gave him a little push off, it wasn't enough to be called for it. People these days get the block and charge call mixed up so badly these days. Austin Peay will miss Dayton, just like we have missed Smith, who was not shy about getting aggressive inside. I believe he would have made a difference against Belmont, as he would not have disappeared on defense. He was solid against Taylor in the second half last year at Peay, and he would have been just as aggressive against Belmont. He defended the basket like a junkyard pit bull in the second half of our championship game last year. He's so fast with the ball that his defense gets underrated. Will definitely miss him the remainder of the year. And to make matters worse, he's past the point of redshirt so he'll miss the rest of his sophomore year with only 2 years left of eligibility. Back to back losses since beating us. That puts us back in control for a double bye. Don’t see us sweeping Peay though. Maybe a trap game for them Saturday night? 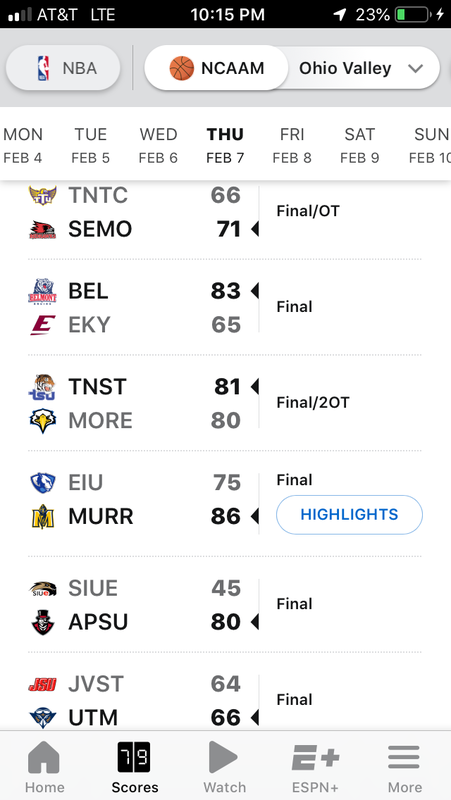 EIU looked awfully tough tonight. That's awesome. Everyone can beat them but us. That’s more telling of their team than ours. And let’s not forget, they beat Belmont. Twice. Amazing how Jax struggles with the teams we blow out. Harper's teams are always like this. Same thing at western. They'd always step it up and beat a couple teams they shouldn't and the turn around and lose a couple they should win.